allegations regarding financing sources for the Hoang Phap Buddist temple and proposed monastery in Elk Grove. Even though formal applications have not yet been submitted, a Buddhist temple and proposed monastery in Elk Grove's rural area is generating a series of controversial claims by a group of Vietnamese-American citizens. The claims were made during the Thursday, October 4, 2018 meeting of the Elk Grove Planning Commission. The comments regarding the proposed temple were made during the public comment on non-agenda items by two distinct groups - nearby residents in Elk Grove's rural Sheldon area and a group identified by two speakers as a Vietnamese-Americans concerned with the possible foreign influence in the United States. The site of the temple and proposed monastery is a 10-acre parcel on Halfway and Excelsior roads. The site is zoned for use as a place of worship. During public comment, several neighbors and members of the Greater Sheldon Road Estate Owners Association voiced concern that the proposed new use of the land would alter their rural lifestyle and negatively affect traffic. Additionally, residents noted building had commenced on the site without permits. Typical of the comments was Excelsior Road resident Jennifer Pool who said the temple would aggravate existing traffic congestion along the busy rural road. "If this temple were to go in, I mean, you may as well take down the rural Elk Grove sign," Pool said. "The traffic that will come along with this temple I think will just ruin our little piece of our rural feeling, and there isn't much in Elk Grove anymore between all the houses that are going up." During the course of comments, Elk Grove Development Director Darren Wilson said the city does not have an application for the site although current zoning would allow a temple place of worship. Before the meeting, a temporary use permit application for stone setting ceremony submitted on behalf of the temple for a ceremony on Sunday, October 7 was denied by the city citing the erection of a stage structure on the parcel without necessary permits. The most controversial arguments about the proposed facility came from a group of people who identified themselves as Vietnamese-Americans who said they fled to the United States as refugees after the fall of the South Vietnamese government in 1975. While the neighbors of the temple voiced typical concerns, two of the people speaking on behalf of the Vietnamese-American contingent in attendance sounded alarms on the financing of the operations. One of those commenting on the funding was Lan-Anh Do who noted several in the audience are Buddhist and are not opposed to the practice, but instead alleged the temple is being financed by the Communist Party and the Vietnamese government. "We particularly oppose the building of this temple because this is an opportunity to spread Communism influence through the Buddist community in Elk Grove," she said (see video below). Do went on to say financing of the temple would under ordinary circumstances be difficult, and the reason it can be pursued is because of foreign government financing. "They are funded by the Communist government in Vietnam," she stated. "We are opposing the spreading of this Communism influence in this country, and we just want to bring that to your attention." "They followed this leader, and they know what he has been doing in Vietnam, and he is just carrying his responsibility from Vietnam over here, and nobody has the kind of money to purchase that much land in Elk Grove" Do stated. "Please don't let Communist in this country." 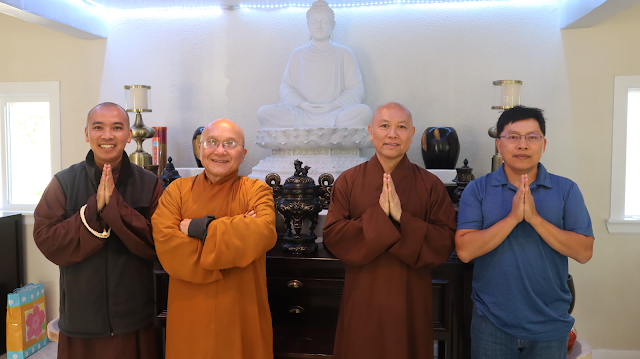 Although Do did not mention any specific Buddhist Master, during a visit to the Halfway Drive temple today, an interview with the temple Abbot and Master, Thich Chan Tinh was conducted. During the meeting, speaking through interpreter Quang Tran, Tinh said the purchase of the temple was through a private citizen with no ties to the Communist party or Vietnamese government. During the meeting, Tinh said the purchase of the land was made by Mr. Ma Dat, who is one of his students. As a student, Dat has donated the land for use as a temple. The Elk Grove temple is affiliated with Hoang Phap Monstery based in Vietnam, which is about 20 km. from Ho Chi Minh City and is one of 33 temples worldwide with Tinh as the Abbot. Although based in Vietnam, both Tran and Tinh stressed they operate independently of the government. "The temple in Vietnam, just like the temple here, or any future temple in the Buddha's name, is dedicated to preserving the peace and love and the open-mindedness of everyone so that everyone will be included," Tinh said. "It is not isolated to only Buddhism, so everyone is included following the Buddha's teaching." Tinh also stated that this temple is following the teachings of Zen Master Thich Nhat Hanh, who is regarded as a leading teacher of Buddism. Among notable events for Hanh was a nomination by Dr. Martin Luther King Jr. in 1967 for the Nobel Peace Prize. Acknowledging the voices of the nearby community, Tinh also said he appreciated their concerns and hoped the misunderstanding about how the temple is being funded can be resolved by learning about one another and be peacefully united. Translating, Tran said Tinh stressed, "we are here to spread the Buddha's word and not relating to any Communism." Tihn also said he hopes "the city council is open minded to receive us as an addition to the city and help it grow." 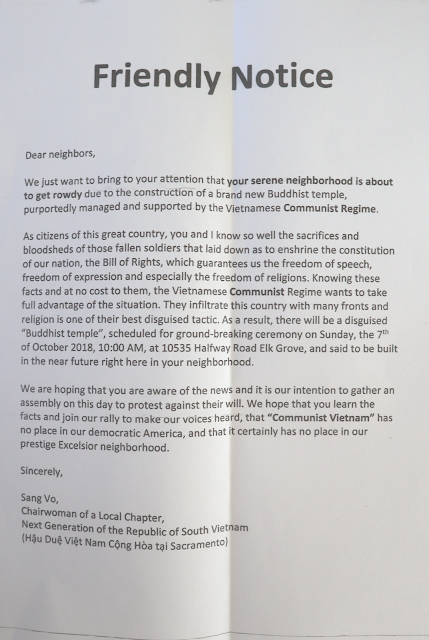 Earlier today, the temple shared a letter (see below) they received from a group called the Next Generation of the Republic of Vietnam who called for a protest in front of the temple on Sunday, October 7. Because the temporary use permit was denied by Elk Grove and out of security concerns, the stone setting ceremony was moved to an undisclosed location. Tinh also acknowledged the situation might be causing stress for the neighbors, and that is not their intention. The student who bought and donated the 10-acre parcel to the temple, Mr. Ma Dat noted he too was a Vietnamese refugee who came to the United States in 1979. Dat stressed he purchased the land free of any association with the Vietnamese government. "I paid for this with my own money," Dat said. "The master does not have any relation with Vietnam." Confucius say, "controversy during election season make fortune cookie crumble".